Penetrating damp, unlike rising damp, can be found at any height in a property. 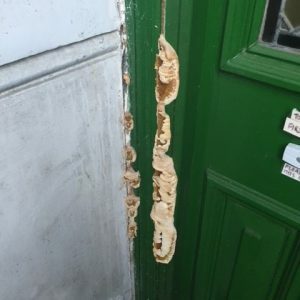 Rotten external joinery items such as window and door frames, sills, thresholds etc. 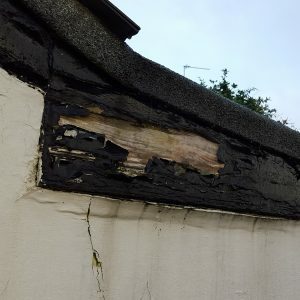 Unfortunately, all of the above can ultimately lead to damage; particularly to timbers which are in direct contact with damp affected areas and which are susceptible to fungal decay. This decay can sometimes go unnoticed particularly in ground floor sub floor voids, where air bricks may have been blocked up with soil. Over the years, flower beds, paths and driveways are built up against external walls, which leads to the sub floor air bricks being either partially or totally blocked. Sub-floor ventilation is very important as it helps keep the area within the void relatively dry. It is worth noting that, if the sub-floor void (under the suspended floor at ground floor level) is dry and well-ventilated, the risk of high moisture levels that could result in condensation above floor level are also reduced. When checking the roof for any leaks or gaps showing daylight, it is also important to check the chimney stacks. Damp patches and mould can also appear following continued penetration damp. These patches increase, or often become darker, following rain-fall. This can be the result of hygroscopic salt contamination of the internal plaster. The first approach when carrying out any repairs is to ensure that the property is watertight and, if it is identified as a contributory factor, to eliminate further water ingress. It may then be necessary to allow the property some time to dry out before undertaking remedial work. Where there has been damp penetration, we often suggest that it is a good idea for clients to mark with a pencil or similar, areas where damp patches are evident and then, to wait for heavy rainfall to ensure that all maintenance repairs have been successful. Sounds simplistic but it does help ensure all areas are fully covered. It may be necessary to remove damp plaster/brickwork and timbers as necessary. If Dry Rot has occurred, it is important that an expert is called in. Ideally the chosen expert(s) should be registered members of the PCA (Property Care Association). They will be able to ascertain the full extent of the attack. Dry Rot can spread very quickly in prolonged damp conditions. 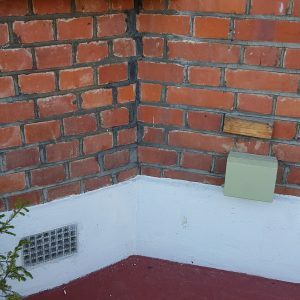 Penetrating damp can to some extent be prevented, by ensuring that your property is well maintained externally. This will include regular inspections by you – often best done when it is pouring with rain so that you can identify areas where water ingress may be occurring. who will be pleased to be of any assistance to you.